High Leaping forward, Japeth Aguilar was sent to Ginebra in 5 man trade that involves Jay Washington moving to Global Port. Japeth Aguilar landed with the Commissioner’s Cup finalists in a trade approved by the league on Tuesday, in exchange for Yousef Taha. 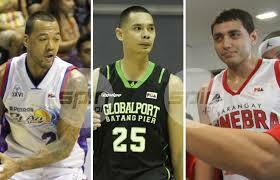 At the same time, Barako Bull Energy Cola acquired forward Elmer Espiritu, also from Ginebra, while the Petron Blaze Boosters sent Jay Washington to GlobalPort, getting back Jason Deutchman in return. After Japeth Aguilar was traded from the Talk ‘N Text Tropang Texters to GlobalPort, there were already rumors that being a member of the Batang Pier would be temporary, a stopover as he was really headed to Ginebra.